One of the major draws of Wichita’s annual Riverfest is its lineup of diverse, nationally recognized musical acts. For the cost of a button ($10 for adults, $5 for ages 6-12), festival-goers have access to nine days of concerts, along with more than 100 free activities. The 2017 roster does not disappoint. Where else can you see four Grammy Award winners, an Academy Award recipient, a Golden Globe winner and a Kennedy Center honoree for $10? Or get a VIP experience for just $25 more? Sponsors and partners help keep the price affordable and the quality of the entertainers high for the event, now in its 46th year. All concerts are general admission – bring your own seating or blankets and find a great spot at one of the two stages. Kennedy Plaza Stage is on the north side of Century II, RedGuard Stage is just southeast across Lewis from the Hyatt Regency Wichita. Riverfest’s entertainment kicks off on Friday night with the traditional Twilight Pops Concert featuring the Wichita Symphony Orchestra at Kennedy Plaza. A Chroma Paint Party – a colorful combo of paint cannons, a light show and electric dance music provided by a team of DJs – will take place in the RedGuard Stage area. The evening will end with the Textron Aviation Opening Night Fireworks. Rolling Stone magazine tagged the Flaming Lips as a “must-see concert” and the Oklahoma City-based rockers are bringing their show to Kennedy Plaza Stage. Prolific alternative music legends, the Lips have released 14 studio albums, one soundtrack, 15 singles and 15 EPs. They have won three Grammy Awards since releasing their first album in 1983. California indie rock nine-piece band Foxygen will open for them. La Raza Fest will bring a Latin-flavored dance party to the RedGuard Stage area that night. Known as LoCash Cowboys when they released the feel-good song, “Here Comes Summer,” the duo now known as LoCash reached No. 2 on the Billboard Country Charts in 2016 with hit single, “I Love This Life,” and are enjoying continued success with their current release, “I Know Somebody.” The songwriters will appear on Kennedy Plaza Stage. The RedGuard Stage will play host to Magic Giant from Los Angeles, and regional favorites Carrie Nation & the Speakeasy. Gospelfest welcomes Stellar Award winner and Dove Award nominee Jonathan Nelson to Kennedy Plaza Stage and will include performances by local groups and choir members. Wichita’s talented theater community will strut their stuff when “Festival of Broadway” returns to Kennedy Plaza with performances by Music Theatre Wichita, Roxy’s Downtown, Mosley Street Melodrama and Laughing Feet Performers. On the RedGuard Stage, popular local singer-songwriter-musician Jenny Wood will host the “Don’t Let Them Get in Your Head” Concert, a special performance inspired by her anti-bullying anthem that has become a rally cry in area schools to stand up and speak out. Students will join Wood onstage for this unique evening that will feature music, art, courage and encouragement. The driving pop punk of Less Than Jake will keep everyone moving at the Wet & Wild Dance Party on Kennedy Plaza Stage. Opening act The Toasters will bring old-school, NYC ska to the party. Country singer Darryl Worley will play the RedGuard Stage that night. Mountain Deer Revival will open. Soul, R&B and gospel superstar Mavis Staples, a two-time Grammy winner who was recognized for lifetime achievement at the Kennedy Center Honors in December 2016 and will be inducted this spring into the Blues Hall of Fame, will perform on Kennedy Plaza Stage. Roots rocker J.D. McPherson will be the opening act. Two multi-Grammy Award winners will headline concerts on Friday, June 9. Singer-songwriter Randy Newman will headline the RedGuard Stage concert. Newman rose to fame in the 1970s with distinctive, often satirical, pop songs such as “Short People.” For nearly 30 years, he has been among the world’s most prolific film composers, captivating multiple generations with works such as Toy Story’s “You’ve Got a Friend in Me.” Newman was inducted into the Songwriter’s Hall of Fame in 2002, the Rock and Roll Hall of Fame in 2013, and has won two Oscars, three Emmys and six Grammy Awards. Louisiana-raised blues pianist and singer Marcia Ball will open. The closing celebration of Riverfest 2017 kicks off at Kennedy Plaza Stage with OK Go. Famous for their creative music videos, these Grammy winners are perhaps best known for “Here It Goes Again,” a video that has received more than 50 million views on YouTube. Experimental pop duo Lewis Del Mar will also perform. Fiesta del Rio, featuring a variety of Hispanic bands, will take place on the RedGuard Stage. The Capitol Federal Fireworks Finale will close the festival with a bang following the concerts. 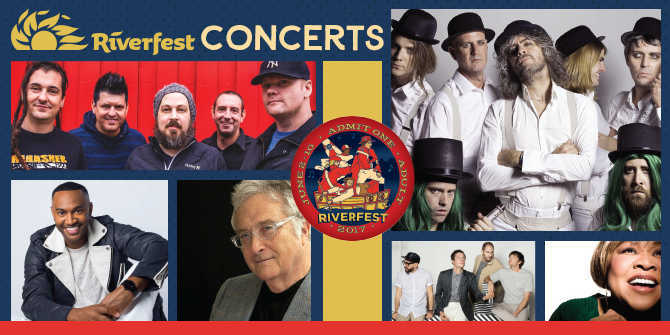 New this year, Riverfest is offering VIP access for several concerts. Tickets are just $25 each, and include special-access viewing, private cash bar and restrooms. All VIP ticket-holders must have a Riverfest button to enter (a button is not included in the VIP ticket). A meet & greet is NOT included in the VIP ticket.